One of my earliest blog posts (second, to be exact) featured some lovely Salted Caramel Double Chocolate Cookies, and in this post my obsession for all things caramel-salted manifests itself once again. A rare sunny day this week prompted me to unearth the ice cream maker from the depths of our kitchen cupboard and make this wickedly rich and decadent creamy concoction. To be savoured in small quantities with great relish because (and I’m not going to lie to you), you WILL feel guilty eating this. But it’s worth it. Heat 1 cup of the sugar in a dry pan on a medium heat, stirring with a fork to distribute sugar evenly. Once it starts to melt stop stirring and cook, swirling the pan occasionally to allow all the sugar to melt and turn a dark amber. Once it does, quickly remove from heat (or it will keep cooking and burn). Add in 1 1/4 cups cream (be careful – the mixture will spatter) and cook, stirring, until all of caramel has dissolved and it is smooth and runny. Pour into a bowl and stir in the sea salt and vanilla extract. Leave to cool. Meanwhile, bring the milk and remaining cream and sugar just to a boil in a small heavy saucepan, stirring occasionally. Lightly whisk eggs in a bowl, then add half of the hot milk mixture in a thin steady stream, whisking constantly. Pour back into saucepan and cook over medium heat, stirring constantly with a wooden spoon, until custard coats back of spoon. Do not let the liquid boil or it will curdle (once it registers 170°F on an instant-read thermometer it is ready). Pour custard through a fine sieve into a large bowl, then stir in the cooled caramel. Chill custard, stirring occasionally, until very cold (3-6 hours). Then churn the custard in ice cream maker until it holds together but is still quite soft. Place in an airtight container and put in freezer to firm up (do note that when it is ready it will still feel softer than regular ice cream). Top each scoop with a few flakes of fleur de sel before serving. ~ by gourmettraveller on February 20, 2010. 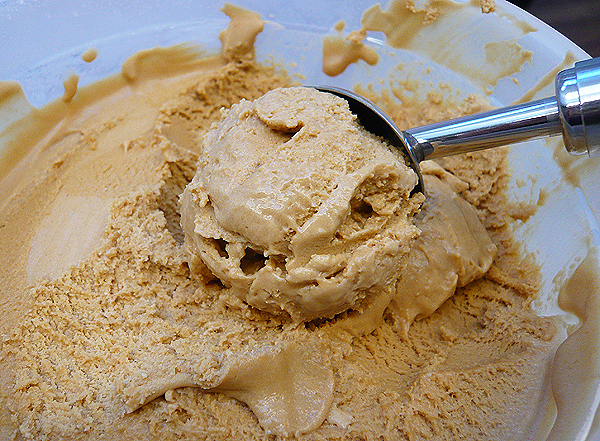 I also have an obsession with all things caramel-salted, and I’m going to have to make this ice cream! Mmmm….beautiful ice cream. I’m going to love this more when summer comes. I LOVE salted caramel but havent had in icecream form before! sounds so good! But I do not have an ice-cream maker!!! How? I’m afraid you will need to invest in one to make this…but it’s so worth it! MMMMM. Here in the land of gelato this would be a great addition. Salted caramel = mmmmm. This looks so fabulous, and far too dangerously addictive for my kitchen. Perhaps this could be an exception… gorgeous! mmm…i’m into salt and caramel right now and of course always love ice cream. looks wonderful and sounds very creamy! well if there ever was a reason to buy one, this ice cream is definitely it! I too am a salted caramel fanatic. I couldn’t resist this. What is “golden caster sugar” in US terms? caster sugar is the same as superfine or granulated sugar – hope that helps! great job and easy to make, definately i will try it soon. Is the double cream mentioned here like clotted cream, or like heavy cream (as in the U.S.)? Thanks, this looks fantastic! yep, double cream is the same as heavy cream. this one’s definitely worth making – it’s gorgeous!